"America's famous fighting cowboy" was a red-headed, red-shirted, two-fisted tornado who thrilled children and teens with his adventures. Red lived with his Aunt, "The Duchess", and his Indian ward Little Beaver at Painted Valley Ranch. They kept busy foiling the plans of their archenemy, Ace Hanlon. 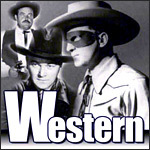 Red's strength, cunning horsemanship and sharp-shooting abilities were put to the test in his continuing quest to bring the wily evildoer to justice. Cattle rustlers, outlaws and murderers didn’t stand a chance against Red Ryder.